Kids’ apps and ebooks can’t teach them to read without parent and teacher support. 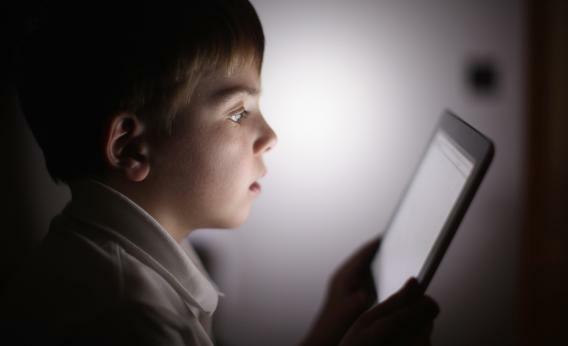 In this photograph illustration, a 10-year-old boy uses an iPad. As touchscreen tablets become the hot holiday gift for children—even for tots still learning to walk and talk—parents can be forgiven for feeling a little confused and skeptical about this new trend, especially when it comes to claims about education. The iTunes App Store boasts more than 700,000 apps and, as the Joan Ganz Cooney Center discovered earlier this year, nearly 80 percent of the top-selling paid apps in the education category are aimed at children. Many of these apps make claims about helping children learn to read. It’s an alluring promise—but are they all they are cracked up to be? As partners with the Campaign for Grade-Level Reading, a national coalition examining reading problems, we set out to answer those questions. For the past eight months, we scanned the technology and literacy landscape examining new products and programs. What we found was a digital Wild West, especially in the teeming app marketplace. Tens of thousands of apps are labeled educational and marketed to parents who receive little to no information about whether and how they work. Most of the top-selling reading apps appear to teach only the most basic of literacy skills. They lean toward easy-to-teach tasks, such as identifying the ABCs, but don’t address higher-level competencies that young children also need to become strong readers, such as developing vocabulary and understanding words in a narrative. A snapshot of the iTunes App Store’s most popular paid literacy apps showed that 45 percent targeted letters and sounds and half focused on phonics. Only 5 percent covered vocabulary, and none addressed comprehension or the ability to tell stories. Many “reading” apps are essentially flashy flashcards: Click on a set of letters and the audio kicks on, uttering the letter’s sounds. Move to the next set and repeat. This imbalance comes as research shows that knowing the ABCs and other basic literacy skills, while important, are not enough to help children become strong readers. Children need background knowledge and vocabulary, too, as made clear last week in the release of vocabulary scores from the National Assessment of Educational Progress. The scores, which are distressingly low for children from disadvantaged backgrounds, showed an integral link between vocabulary and reading comprehension. Until comprehension is addressed, American kids will continue to lag compared to children from nations such as Hong Kong, Singapore and Finland. But apps aren’t the only problem. We also examined the most popular children’s ebooks in the iTunes store and found missed opportunities for literacy development. Ebooks have real potential to exploit interactive features for engaging parents and children around stories, while also providing prompts and assistance when words are too difficult to sound out. But our data on ebooks, while based on a small sample, showed that the e-titles that parents download are not the ones taking full advantage of technology to help children learn to read and understand the story. Popular ebooks based on children’s movies, for example, appear to be designed to be “watched” more than “read,” putting them in the category of child-occupying tools rather than something to actively engage children with the print on screen and the story being told. Few ebooks give children on-ramps to new vocabulary or background knowledge in subjects they may not come in contact with everyday (art, science, history). By contrast, good ebooks for building strong readers will ask questions that lead to interactions with on-screen images that add meaning to the story or help reinforce the storyline. Ideally, such ebooks, coupled with parenting programs in early childhood programs and libraries, could help parents see their value in helping their children, especially for moms and dads who have never felt all that confident reading aloud print books. More than two-thirds of fourth graders unable to read at grade-level (and numbers far worse for low-income children, blacks, and Hispanics). We have to find new ways to help or we will continue to sap the potential of millions of young children. Already the federal government and states have spent billions of dollars to try to tackle the literacy problem, but current policies and practices have only barely budged reading scores upward. With the advent of new technologies, we are at an opportune moment for harnessing digital media to support parents, educators, and children in building the next generation’s reading skills. But technology’s potential to be a game changer will not be reached unless technology is tapped to provide vital new supports for parents and educa­tors. At its best, the technology complements the work of trained teachers and parents. It doesn’t replace it. Lisa Guernsey is director of the Early Education Initiative at the New America Foundation. Michael H. Levine is executive director of the Joan Ganz Cooney Center at Sesame Workshop. They are authors of “Pioneering Literacy in the Digital Wild West,” a new report from the Campaign for Grade-Level Reading. Update, 4:07 p.m., Dec. 13: This post was updated to include two paragraphs that were initially lopped off.